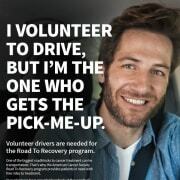 The American Cancer Society needs volunteer Road To Recovery drivers. We've all been touched by cancer, many of you know the multiple appointments and struggles a patient may face as they go through their cancer journey. Let's help get patients to and from treatment. Road To Recovery supports patients with FREE transportation. Volunteers drive patients to life saving chemotherapy and radiation treatments with the use of an ACS owned Dodge Caravan. Our volunteers provide a life saving service on their own schedule. This opportunity is weekdays during regular business hours. Volunteers determine their schedule; which days to drive, how far, and how often. Drive patients in your own community to their appointments. Passion to help others, valid Michigan driver's license, and insurable driver.